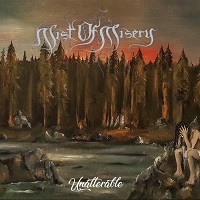 Hailing from Stockholm, Sweden, comes Depressive/Symphonic Black Metal icons MIST OF MISERY. “Unalterable” is the band’s third full-length release, and contains 14 tracks; two of them are covers (“Red Snow” was originally performed by COLD WORLD and “Stormblast” by DIMMU BORGIR). “A Window into Nothingness” opens with solemn female vocals, as if in a choir. They maintain a steady presence throughout the track. “Halls of Emptiness” is next. Opening with clean but bitter guitar tones, a vocal track comes into play, barely audible, followed by tortured screams. The music is very pretty and the juxtaposition with the vocals is noteworthy. It pauses for some light strings and then returns. When the piano notes come in, it’s like a new life has sprung from the pit of Hell itself, and up to the Earth above. “Heir to Misfortune” opens with charming keys, leading to a fast moving track with blast beat drumming. When the vocal screams come in, they rage with anger, yet the music stays beautiful. You don’t know whether to rejoice, or cry out in despair. “A Forest of Disenchantments” is another instrumental consisting of more of that female choir from the opening tracks. Guitars build in the background and a steady beat develops. “Red Snow” is a COLD WORLD cover, but it fits very well into the theme of the album. The music builds in ominous tones while the screams fill the background. “Desolation” opens with clean guitar notes and that feeling of loneliness comes full bore. Similar to other songs, the vocals rage while the music maintains that pretty but cold feeling of despondence. “Bleak Autumn” Is as the title suggests…a cold autumn morning with winter on the horizon…all the leaves have fallen and a chilling breeze turns your blood to ice. “A Hollow Promise” opens with piano notes that are solemn and mesmerizing in their rhythm. Twin guitars join in with the same feeling. Spoken words come in, hinting at something unknown. The piano notes are absolutely beautiful. The melody shifts to the guitars and screams take the song to completion. “Embracing Ruin” opens with clean guitar notes, doleful in nature. The main riff hits with might and power, and then the drums roll in. Following some incensed vocals, the song returns to the opening melody, adding choirs to the mix, creating a very powerful experience. “Stormblast” is a DIMMU BORGIR cover from back in the day. They do a nice job of honoring the original while adding their own stamp to it, and again it fits into the album’s theme with ease. “The Dying Light” has the melody carried with keys. It’s quite charming, in a “you never want it to end” sort of way. It’s a simple melody but if it doesn’t make you long you better check your pulse, because you might be dead. “Within Dark” opens with piano notes and lead guitar in what is a very dark melody. It has a commanding presence that is also frail at the same time. How these guys are able to pull this off is what makes the album so special. “Unalterable” opens with that church organ, grinding out chilling notes that take the form of a specter coming for your life. Those choirs come back into play again, cutting against the angry screams like an angel being lifted to heaven. “Eternal Bereavement” closes the album, with a simple piano melody with a “Moonlight Sonata” vibe to it. Strings come in ever so gently, and it the perfect ending to the album. Overall, even though it was 14 songs, each left an indelible mark on the listener. I’ve always said that there can be beauty found in depressive music, and this is very much the case here. They build this absolutely alluring sound that make you feel like you are slowly drowning, but somehow you don’t care. Sinking deeper and deeper into a dark lake, you go willingly to your doom.